April 1, 2019 - Fill a 2-ton ore cart and run it down a track. 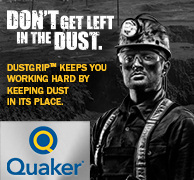 Find lead shots in a dirt-filled gold pan. Build a section of rail tracks, then tear them down in as little time as possible. These are a few of the old-school mining tasks that have evolved into competitive events mining teams from colleges around the world have been battling against each other in during the International Intercollegiate Mining Games for over 40 years. A recent photo of the Montana Tech Mining Team after competing in the International Intercollegiate Mining Games in Virginia City, Nevada, last week. The Tech men's team won first place and the women's won second. 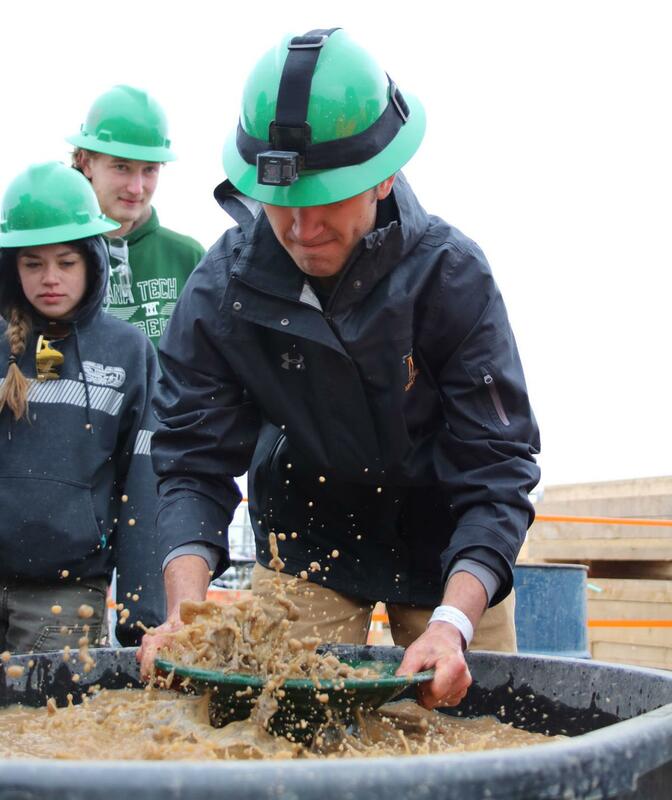 Last week, the annual competition took place in Virginia City, Nevada, and the Montana Tech Mining Team found themselves on top — the men’s team took first overall and the women’s team placed second. “When we found out we had won, everyone in the Tech section (of the award ceremony) was on their feet. It was obvious we had been waiting for that moment for a long time,” said Seth Salusso, one of the multi-event competitors on the men’s team. Montana Tech’s mining team is as old as the two-day, seven-event international competition, which started in 1978, according to team faculty advisor Scott Rosenthal. He and fellow mining engineering faculty member Chris Roos have been advising the Tech team for the past six years — and are also team alumni. “It’s nice that they finally won,” Rosenthal said, noting the last time the men’s team won was in 2008. Darby Medley pans for pieces of lead as Jesslyn Valle and Alex Davis look on during the co-ed gold pan competition at the International Intercollegiate Mining Games last week in Nevada. Teams from all over the world compete in the annual event. Tech’s mining team has competed in the annual games every year. Men’s, women’s and co-ed teams travel across the U.S. and around the world for the games, Rosenthal explained, which have become a sort of prestigious mining competition. The schools that compete hold onto their top place titles tightly. A Google search of the games brings up various websites that state something like the games “began in 1978 to honor the memory of the 91 miners who died on May 2, 1972, when fire broke out in the Sunshine Mine near Kellogg, Idaho.” This seems to make sense, considering the men’s first place trophy is called the Sunshine trophy. 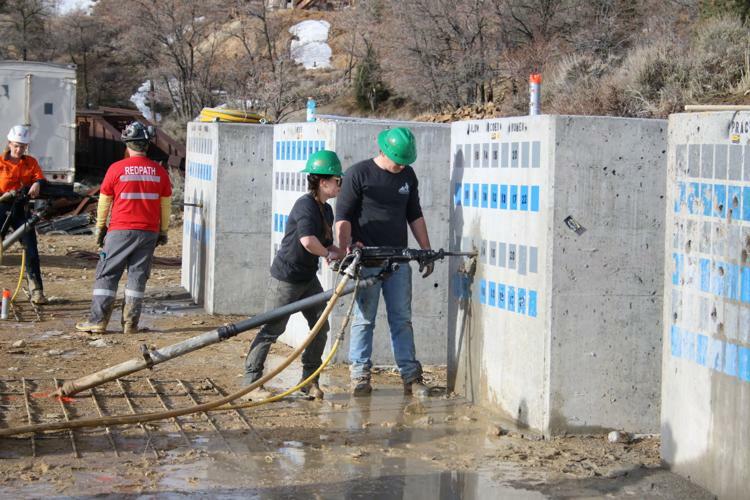 Chase Kent assists Jesslyn Valle during the co-ed jackleg drilling event at the recent International Intercollegiate Mining Games in Virginia City, Nevada. Men's, women's and co-ed teams from around the world compete in seven events every year. But according to Robin McCulloch, the Montana native who helped found the organized mining games, that’s simply not true. On Thursday afternoon in mining engineering professor Thomas Camm’s office, McCulloch sported faded blue overalls with a button down, blue Carhartt shirt to match, leaned back in a chair and recalled the first official mining games, which were actually held in 1979, he said. McCulloch explained that he had recently transferred from Montana Tech to the University of Idaho mining engineering program, which no longer exists. After informally competing in mining skills games with his peers one night, McCulloch suggested turning the games into an intercollegiate competition. The other men involved jumped on board and organized the inaugural event in Moscow, Idaho. Five or six teams from Tech, Arizona and Washington came for the first mining games, which had a stronger emphasis on the beer-chugging event than present-day, McCulloch said, laughing. He also emphasized that the event was held the same weekend as a similar forestry skills games, which made for an interesting final feat. “The last thing we did was we challenged the timber beasts to a tug-of-war competition … and towed them into a pond,” McCulloch recalled, laughing. From there the mining games took off, becoming an international event for men and women in mining or engineering fields. 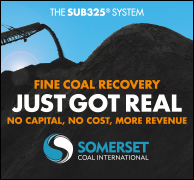 The competition has become a way to honor miners who have died on the job, like those in the 1972 Sunshine Mine disaster, and helps keep the old-fashioned mining skills and methods alive. 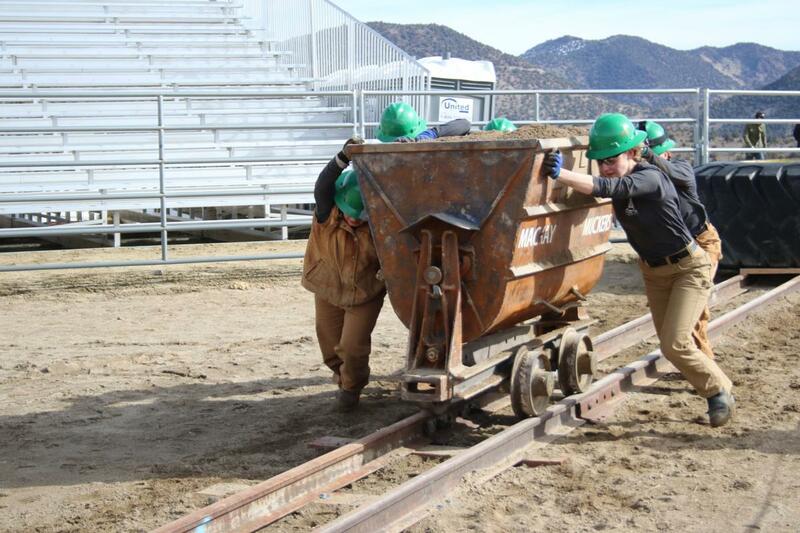 Montana Tech women's team members, from left, Emelina Doucette, Shayne Burgess, Marie Waldbillig, Adele Berg and Johanna Stinson push a full, 2-ton ore cart down a track during the mucking competition at the International Intercollegiate Mining Games last week. The team placed second overall. But despite its growth in size and expense, McCulloch believes the purpose behind the start of the games is the same: to have fun and connect with others in the mining-related fields. On a recent afternoon in a Mining and Geology building conference room, five of the roughly 30 current Tech mining team members echoed McCulloch’s thoughts and talked about what the recent games were like. Most of them competed in nearly all seven events, which they say require a diverse set of skills and help them reflect on mining in the past. On top of discussing logistics and historical perspective, all of the team members also touched on how it felt to take home first- and second-place titles. Salusso, Darby Medley and Nick Warman said the Tech men’s team hadn’t placed first at the international competition in 11 years, and this year was the resurrection of the all-women team, which hadn’t existed in roughly 10 years — making the results for both teams extra rewarding. “I had never been so happy, I burst out crying. It was so weird,” said Nick Warman, a second-year men’s team member. “It was pretty cool … We only had one person returning so we had a rocky start in some events, but pulled through,” said Kylie Stedtnitz, a women’s team member. In fact, most of this year’s Tech mining team was new. The five students said only 11 of the 30 members were returners, which presented some challenges. However, through “after hour’s social events,” the students said they feel the team has bonded and introduced them to close friends and future co-workers, creating a tight-knit community spread across various Tech engineering fields. “I’m pretty sure I’ve actually bargained with people, telling them I’d help them with homework if they helped me with gold panning,” Stedtnitz said, laughing.